Ever feel like you are just “going through the motions” of your life and not really engaged in it? It’s something that happens to all of us, at one time or another. Sometimes, demands overwhelm us to the point that we become robotic – Determined to complete tasks at no further cost to us emotionally. Or, we get into a rut: Repeating the same series of actions every day or every week, until our eyes glaze over with indifference. We are in survival mode. It can happen in our jobs, our social lives and our relationships. Surviving can be a good thing, right? Certainly, it beats the alternative! And there are times when surviving is all we can handle. For example, when we’ve suffered a loss such as the death of a loved one or a divorce: Going through the motions gets us past the pain and suffering. It’s comforting to feel the ordinary rhythm of our lives at times like that. Those periods are temporary, hopefully. If you think about it, you probably know someone who lives their life that way. He or she has a routine work week and predictable weekends. It’s intentional. This is what is required to support their lifestyle – A nice home, a decent car, a couple of kids, a yearly vacation. They see themselves as successful. They are content: Nothing wrong with that! But, for some of us, that’s not enough. We have a burning desire to stretch our minds by learning new things. There’s a hunger inside of us that we must feed by experiencing fresh adventures. Not content with merely surviving, we want to thrive! Survivors have sight. They see things as they are. They are satisfied with present circumstances. They view the world with their eyes. Thrivers, however, have vision. We see things as they could be. We are forward thinkers. We see the world with a different lens – One that utilizes heart and soul. Survivors know who they are. They are right where they want to be. They are satisfied. Thrivers know who they are but also know who they want to become. They know where they are going. They often appear discontent or restless. Survivors have a plan. They follow a roadmap to get from point A to point B.
Thrivers have a calling. They follow their passion, enjoying the journey, often diverting along the way to pursue other endeavors. 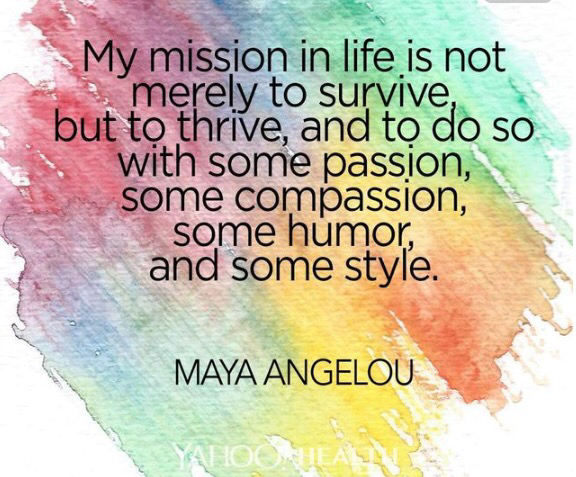 Whichever you choose – Survive or thrive – Do so intentionally. Respect and enjoy those who live the other way. And, if surviving is leaving you feeling unfulfilled, think about a new personal endeavor. Spread your wings – You never know where it might lead, but you just might thrive! < Previous Just do it.